Research Animal Guidelines — Are they for the Birds? There appears to be a striking incongruity in the requirements governing the ethical and humane treatment of vertebrate animals used in research. Some animals lack proper representation, as discussed in this post. Japanese quail (Coturnix japonica). Photo by Ingrid Taylar, licensed under CC BY 2.0. Wildlife toxicity testing generally focuses on two groups of vertebrates: birds and mammals. When it comes to protecting unborn mammals, Institutional Animal Care and Use Committees (IACUC) are fully engaged. By way of example, I conducted a study where I needed to collect adult female rodents in the wild to assess ovarian follicle development. My IACUC was adamant that only non-pregnant females be harvested. It was reasoned that if non-pregnant females could suit my needs, there was no justification for unnecessarily snuffing out the life of soon-to-be newborns that would likely be reproducing themselves someday. In a lab setting, if a pregnant mouse or rat is anesthetized and its fetuses removed for study, any IACUC adhering to the Guide for the Care and Use of Laboratory Animals (“The Guide”; NRC 2011) would insist that otherwise intact fetuses be humanely euthanized. So then, we are concerned about the way animal users terminate the life of the unborn. However, we are not necessarily rendering the same level of care for unborn birds as we do for unborn mammals. We can all understand the need to humanely euthanize unborn rodent pups in prescribed ways, for fetuses of common lab mammal species delivered early via surgery are not going to survive. In contrast, unborn birds develop externally, in eggs laid by the female. 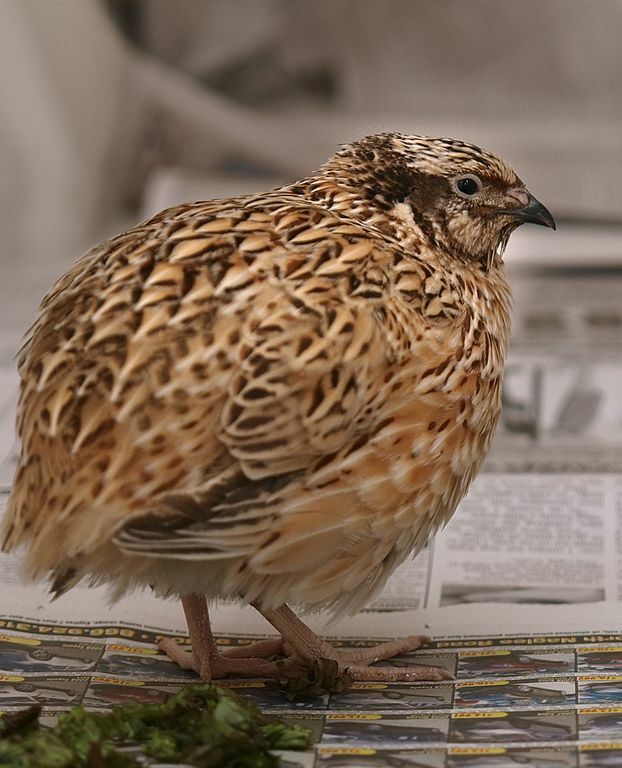 If male and female Japanese quail or mallard (common avian lab models) should be pair-housed in the lab, fertilized eggs might be laid and may not be important to the given study. Realistically, those fertilized bird eggs could survive under the right conditions; therefore, the matter of how to dispose of the fertilized eggs is a legitimate one. Why then, it is thinkable to, say, cook and eat fertilized eggs that were laid in the lab? If you are shocked at that question, then let me assure you that it is done quite regularly, hence this blog post! The eggs that most people eat are store-bought and unfertilized. Identifying whether an egg is fertilized or not is an easy procedure using a technique called candling, but there is no animal care and use requirement out of any agency mandating this. I suspect that finding an explanation for the default allowance to consume fertilized eggs isn’t quite as simple as noting that fertilized eggs are edible whereas rodent pups, we trust many agree, are not. It could be argued that embryonated eggs are insensate, or that heating (i.e., through skillet cooking) eggs is a humane method of disposal, or perhaps the developing young life inside an egg is so masked and so removed from our thinking, that our attention isn’t really focused as much as it should be on the consequences of our research animal disposal practices. We may not be able to uncover the source of the default allowance to cook fertilized eggs, but we can look at the history of agencies that ordinarily drive animal care and use, and consider our own lab practices. 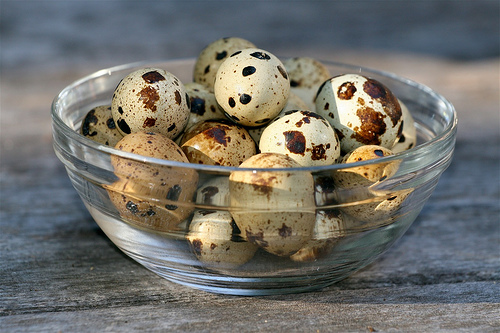 Quail eggs. Photo by RatRanch, licensed under CC BY 2.0. The American Veterinary Medical Association (AVMA) provides recommended means for disposing of embryonated eggs, although what’s discussed in those guidelines pertains to poultry (AVMA 2013); finding provisions for non-poultry birds requires a bit of investigation. Embryonated poultry eggs may be destroyed by prolonged exposure (20 minutes) to CO2, cooling (4 hours at 40ºF), freezing, or addling (destroying the embryo in the egg prior to hatching by violently shaking the egg). Where I work, unwanted eggs that researchers don’t candle are frozen, and so we’re probably in compliance, assuming that we need to be. Relying on AVMA guidelines to prescribe how to destroy non-poultry eggs from research labs is most definitely not a straightforward affair. For example, native wild birds are protected throughout the U.S. by the Migratory Bird Treaty Act. If it’s those sorts of birds you’re working with, you should know that there can be fines and jail time to serve for each addle! To the extent that anyone is bothered by the permissibility of cooking fertilized eggs in the lab , or even the non-requirement to establish that lab-laid eggs are fertilized altogether, we could point to “the Guide” and the absence there of any discussion whatsoever on eggs. Tracing the matter back to its ultimate source, we arrive at the Animal Welfare Act (AWA) of 1966, strengthened subsequently with amendments in 1970, 1976, 1985, and 1990. Authorities delegated to the U.S. Department of Agriculture (USDA) to implement the AWA are responsible for the highly regarded IACUC concept, i.e., that each institution conducting animal research, testing, or experimentation, must assemble a group to review and approve protocols before studies can commence. It’s because of the AWA then, that IACUCs have an attending veterinarian involved and present at all phases of study, and that we have the tightest of strictures on an exhaustive list of animal study elements. The latter cover a veritable gamut of things that include required minimum ceiling heights of rabbit cages, the prohibition of using expired-date anesthetics, dog exercise schedules, detailed animal pain alleviation procedures, and lots more. Lest we marvel excessively at the trickle-down influences of the AWA, we should note that the AWA doesn’t address bird eggs, and that’s because AWA doesn’t address birds used in research altogether . . . just as the AWA excludes rats and mice used in research, livestock used for food or fiber, reptiles, amphibians, fish and invertebrates. With 95% of the animals used in research being mice and rats, the vast majority of research animals are excluded from AWA’s protection! In light of the above, it’s easy enough to understand why researchers have no compunction with serving up a byproduct of their research with hash browns and toast. Whether or not we see a level of animal care provided that we would expect, it comes down to the transmission and enforcement of the AWA message, which begins with proper attention being given to the many animals that aren’t even covered by the AWA. For now, the National Institutes of Health Office of Laboratory Animal Welfare (NIH 2002) doesn’t address eggs, and the USDA’s Animal and Plant Health Inspection Service addresses only the importation of eggs to be used in research protocols (APHIS 2013). Speaking for the Department of Defense agency I work for, I suppose I should be thankful that bird egg treatment does register with our IACUC staff. Until you can say the same, bon appetit? American Veterinary Medical Association (AVMA) 2013. AVMA Guidelines for the Euthanasia of Animals: 2013 Edition. Animal Welfare Act, Public Law 89-544, 80 Statute 350. National Research Council (NRC) 2011. Guide for the Care and Use of Laboratory Animals. Eighth Edition. The National Academies Press, Washington, D.C.
National Institutes of Health (NIH) 2002. Public Health Service Policy on Humane Care and Use of Laboratory Animals. Office of Laboratory Animal Welfare, Dept. of Health and Human Services, Bethesda, MD. This entry was posted in Health & Ecological Risk Assessment, Toxicology, Uncategorized and tagged animal research, AVMA, AWA, IACUC on February 4, 2014 by Integrated Environmental Assessment and Management.